As the European cruise market grows, so does the need for facilities at which to handle the new ships and their passengers, especially as they begin to carry 4,000 and more passengers. This growth in the market has led to new cruise terminal developments, the most important of which to date has been the creation of an entirely new cruise port at Savona in Italy. 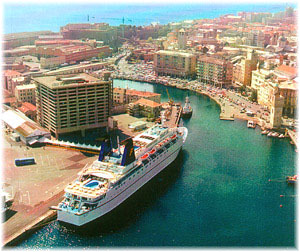 In November 2003, Costa Cruises opened its dedicated cruise terminal at Savona, not far to the west of Genoa. Named Palacrociere Savona. Modern and extremely efficient, the Palacrociere is completely up to date when compared with Genoa's old Transatlantic terminal, the Stazione Marittima, and is even equipped with free Internet connection for those who wish to avail themselves of it. It can also be used for conferences and conventions. Costa has invested heavily in Palacrociere, which has just added a third berth. It has a 22-year management contract for this facility, in which its original 2003 investment was €3.9 million. Last year saw Costa open its €12 million Palacruceros, offerng 157 cruise departures from Barcelona handling 400,000 passengers. This year it expects 190 calls and 500,000 passengers. Costa has taken a 25-year lease on its Spanish facility, which is now also the site of its Barcelona office. Other members of the Carnival Group will also able to avail themselves of this facility. So far in 2008, Barcelona has seen its traffic rise by 18.5% over 2007 and on the basis of the total cruise business the port has developed it now stands as the number one cruise port in the western Med. Costa Cruises, MSC Crociere and Louis Ltd, parent company of Louis Cruise Lines have been short-listed as a preferred bidder to operate a new Gare Maritime de Croisiere on Marseilles' Leon Gourret Pier. A decision is to be made by the end of September. These three operators together can provide 450 calls and 1 million passengers to Marseilles. 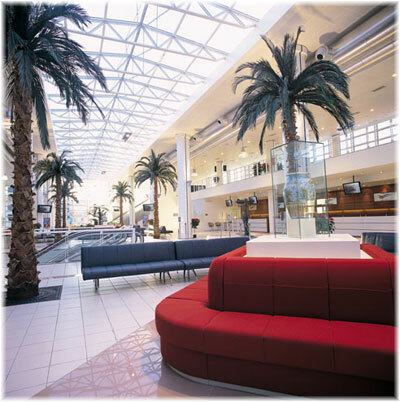 The present Marseilles Provence Cruise Centre, opened in 2003, was the largest such terminal in the Mediterranean when it opened. But as the market continues to grow, new capacity is needed. Meanwhile, in the eastern Med, the Zenon consortium, in which Louis has a 22% share and Costa Cruises 10%, recently won a bid to develop a new €1 billion cruise port at Larnaca in Cyprus that could see it become the largest cruise port in the eastern Med. The site has been chosen in preference to existing port at Limassol because Larnaca is the site of the international airport. However, the other two bidders in the Larnaca contest, D J Karapatakis & Sons and A Vouros Investments, are suing the Cypriot Minister of Transport in objection to its decision. The other partners in the Zenon consortium include Bouges Batiment International of France and local builder Iacovou Brothers, each with 17.5%, both of whom are also partners in Hermes Airports, the firm that is building the new airports at Larnaca and Paphos. Back in Italy, meanwhile, the old Stazione Marittima, like Genoa's once a terminal for Transatlantic liners, has been rebuilt as a cruise ship terminal. It has been managed since June 2005 by a consortium called Terminal Napoli that includes 20% investments from each of Costa and Royal Caribbean and a 5% share from MSC, which is based in Naples. It now offers seven berths and offers a kilometre of dock space. As well as a cruise terminal, it also operates as an exhibition and convetion centre, showing that the expansion in cruise shipping can mean more than just more shoppers and more airport users. 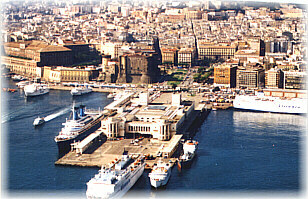 Likewise, Civitavecchia's Roma Cruise Terminal is now a company in which Costa, MSC and Royal Caribbean all hold shares. Plans are now in hand to develop the seven cruise berths in this local port, 72 kilometres from Rome, and several transfer companies now operate dedicated cruise shuttles to the port from Rome's Ciampino and Fiumicino airports. The outcome of these developments will be interesting to measure, and more cruise terminal developments are bound to follow. As well as being outlets for the local European populations to board cruise ships, they will also attract millions of visitors from Northern Europe, North America and around the world. That the cruise lines have chosen to get involved is interesting. By far the most in evidence is the Carnival Group, through the European operations of Costa, which has also expanded into overseas terminals at La Romana in the Dominican Republic, while parent Carnival has invested $50 million in its new Mahogany Bay terminal Roatan (where Royal Caribbean has separate arrangements), and at Grand Turk in the Turks and Caicos. Back in Europe, Carnival last December signed a 20-year agreement for a fourth cruise terminal in the port of Southampton. To be located at the Ocean Dock, it will also give Carnival lines (which of course include Cunard and P&O) priority use of the Queen Elizabeth II and Mayflower terminals. This is only early days for cruise line involvement in shore terminals and was originally spurred by the need to handle the new generation of megaships efficiently in Miami and Port Everglades. One cruise terminal however, has been out of business for a year. The new terminal at Costa Maya, Mexico, where the pier was 50% destroyed by a direct hit by Hurricane Dean, the strongest tropical storm of the 2007 season, a year ago this week. It is expected to re-open within the next few weeks but meanwhile ship's itineraries were decided months ago now and it will take some time to get the business back to the level of one million visitors per year it claimed to have reached Dean. What will be interesting to see is whether any of the large infrastructure companies, state investment funds and pension plans begin to take an interest in cruise ship terminals as they have with container terminals worldwide.